A few days ago, Metta World Peace (it’s just so hard to write that and not laugh) of the Los Angeles Lakers hit James Harden of the Oklahoma City Thunder in the head with an elbow. He claimed afterward that it was accidental. It was part of his celebration of the previous play, and Harden just happened to be in the way. Watching the video of the incident, it’s hard to believe in World Peace (sorry, can’t resist). Much of this is seriously uninteresting. 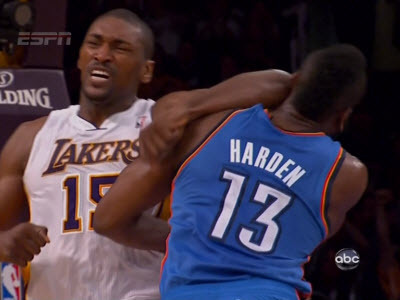 World Peace (formerly, Ron Artest) is a thug and a hopeless attention-seeker. In 2004, after sparking the worst arena-wide brawl in NBA history, he went on radio talk-shows hawking his rap CD. What I do find interesting, however, are the tortured justifications of an obviously intentional and brutal action. I say this because I have the same tendencies toward self-preservation that drive me to try to evade the truth and obfuscate in order to escape blame. I have found that when I’m wrong—when I’ve spoken hurtful words or behaved selfishly—I enact World Peace (alright, that’s enough). When I’m wrong, my heart races with self-justifying impulses and my mind frantically casts about with strategies for self-preservation. And I look just as stupid. The impulse for self-preservation—trying to preseve as much dignity as possible—prevents genuine reconciliation. True freedom and genuine reconciliation are possible only when I speak frankly. However painful it is, I need to speak honestly about what I’ve done and ask for forgiveness. That sort of truth-speaking opens up hope and clears the way for reconciliation. It satisfies the heart of the one I’ve wronged and it’s the only way to open up roads of redemption.